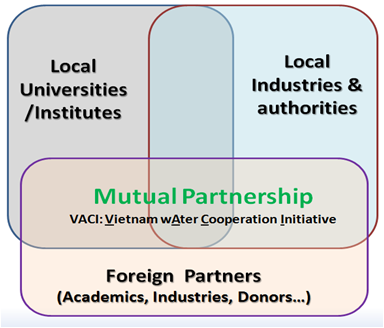 Vietnam wAter Cooperation Initiative (VACI) is the Vietnam-based global platform to share and co-create innovative water solutions with particular emphasis on Vietnam and tropical water issues. Stakeholders from the global water industry gather at VACI to share business opportunities and showcase the latest water technologies. Under auspice of Ministry of Natural Resources and Environment (MONRE) of Vietnam, VACI has been held annually since 2012 and gathered stakeholders from the water industry around the world to share business opportunities and showcase the latest water technologies toward water sustainability in Vietnam and the region. Detailed presentation of VACI Initative can be found at here.